Handmade Barefoot Sandals from Etsy Shop GPYoga. The latest beading trend that’s come up on our radar here at Eureka is Beaded Barefoot Sandals for summer. Long popular for beach weddings, the Indian Style Barefoot Sandals have started to get really popular for this summer season and have even been popping up paired with shoes. Summer is the time to air out your toes and feel the grass under your feet. 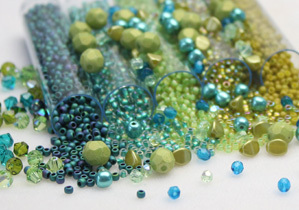 Ornament your bare feet with a variety of Czech glass and Swarovski crystal beads this summer and be stunning in the sun! Beautiful for bridal parties, use Swarovski Crystal Pearls or Czech Glass Drops for this fanciful ornament. The barefoot sandals above use tiny little seed beads, larger Czech druk beads and Czech pressed glass leaves. Another variety of barefoot sandals using a combination of bead caps, Swarovski round beads and Swarovski bicones. To make your very own beaded barefoot sandals like those above check out our brand new step by step tutorial! What do you think? Will these beaded barefoot sandals be all the rage this summer or just a passing fad? Ugh I am SO doing this! Thanks for the ideas. these are very cool, will you be doing a tutorail on how to make them? Possibly sometime in the future we will be able to do so but it may take a while. There are plenty of resources on the web if you google barefoot sandals DIY. Good luck! What is the best store for finding the shoes that will look best with the barefoot sandle? I live on an island so online shopping is best. Also, where can I find instructions for the more complicated designs? Any open shoe will work with the barefoot sandals so pick whatever is your favorite style or just go barefoot! You can search the web for other designs or check out our tutorial page for some ideas!